An experienced political tactician, public administrator and Vice-Chairman of the Lagos West Senatorial district of the All Progressives Congress, Chief Folusho Ologunde, has been appointed the Director General of the Akinwunmi Ambode Campaign Organisation. According to a press statement by the media team of the campaign organisation, Chief Ologunde, who was also once the Deputy Publicity Director of the APC in Lagos State, will lead a team of seasoned and committed politicians and professionals to co-ordinate the activities towards the election of Akinwunmi Ambode as Governor of Lagos State in 2015. The statement also announced Mr. Adeniji Kazeem as Deputy Director General of the campaign organisation. Mr. Kazeem is an experienced lawyer and consummate strategist. Similarly, a former Managing Director and Editor-in-Chief of National Mirror newspaper, Mr. Steve Ayorinde, was named as Director of Media and Communication for the organisation. The Chief Ologunde-led team will assist the Epe born candidate, Akinwunmi Ambode, to intimate Lagosians with his manifesto of continuity and progress as well as co-ordinate the campaign that will witness a series of mega rallies, door to door activities and media outreach carefully designed to bring the message of Akinwunmi Ambode to every doorstep in Lagos. The Lagos State Governor, Mr. Babatunde Raji Fashola (SAN), today donated 57 buses to the local governments and community development areas in Lagos State. The buses were handed over to the Party Chairmen of the 57 local governments to be used in the forthcoming elections. The State Chairman of the Party, Chief Henry Ajomale, thanked the Governor for the massive gesture and assured him that the party would put the buses to good use. He assured party faithful that the party would leave no stone unturned to retain control of the State and continue in the tradition of excellence that the party is known for in the state. Many top party members were at the event including the All Progressives Congress Governorship Candidate, Mr. Akinwunmi Ambode. Other dignitaries at the handing over ceremony were the State Deputy Chairman of the APC, Cardinal James Odumbaku, Speaker of the State House of Assembly, Rt. Hon. Adeyemi Ikuforiji, former Deputy Governor of Lagos State, Abiodun Ogunleye, South West Women Leader, Mrs. Kemi Nelson, Chairman Lagos Central, Fuad Oki, Senator Tony Adefuye, top members of the Governor’s Advisory Council, Alhaji Sunmola, Chief Bushura Alebiosu and Oba Olatunji Hamzat. 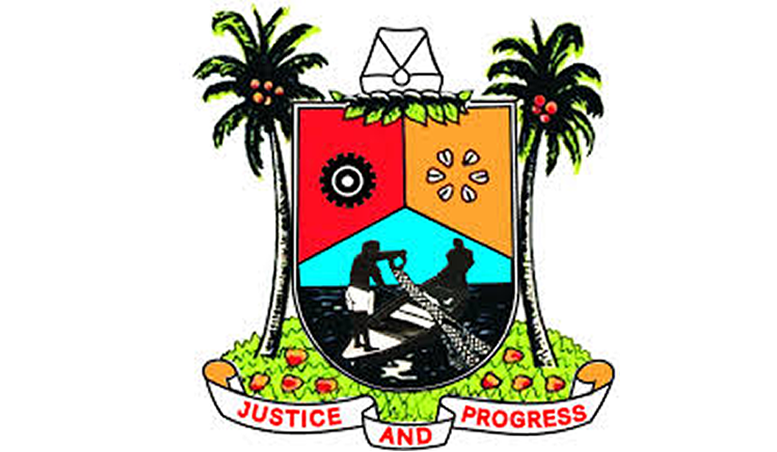 The Lagos State Government has reiterated that its commitment to make the state remain economically viable is firm. This it stated today at the town hall meeting with the Lagos State Council of Tradesmen and Artisans (LASCOTA) and Farmers, held at the Blueroof Hall of the LTV Complex, Agidingbi, Ikeja. The meeting had in presence the Governor of the state, Governor Babatunde Fashola, his deputy, Mrs. Adejoke Orelope-Adefulire, the governorship candidate of the Lagos state All Progressive Congress (APC), Mr. Akinwunmi Ambode, his running-mate, Dr. Oluranti Idiat Adebule and the Vice-Presidential candidate of the APC, Professor Yemi Osinbajo. Governor Fashola said that the state had always recognized the treasure in the informal sector of the state, and the importance of continually creating an enabling and business-friendly atmosphere for them. This he said the government under his watch had done and will keep doing, especially if the people keep voting in the platform, that is the APC, through which such good works had been done. 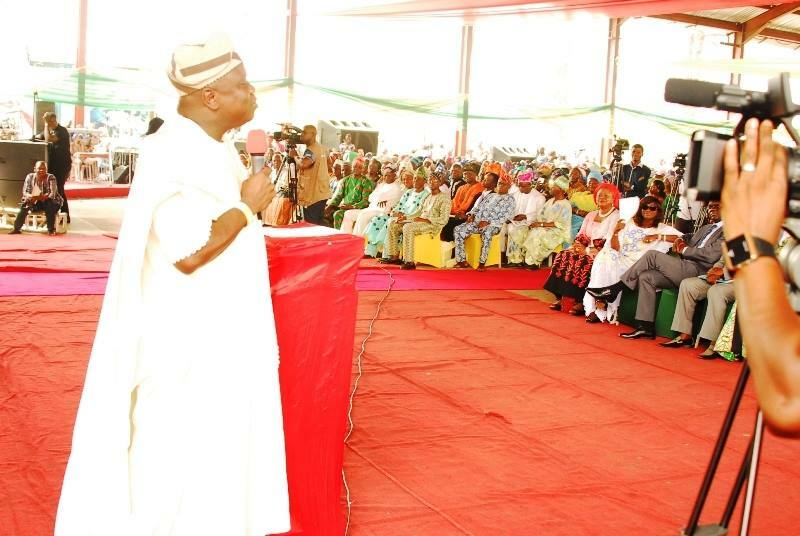 The Governor also seized the moment to canvass support of the association and its members there present, to ensure victory for the APC in the forthcoming general elections, urging that the incumbent government at the Federal level deserves to be voted out since it had failed in the fulfillment of its promises, especially as touching the wellbeing of artisans and all Nigerians alike. Speaking in his native Yoruba dialect, Mr. Akinwunmi Ambode stated that he readily acknowledges the fact that the informal sector, which comprises the artisans, tradesmen and farmers, makes up 85% of both the population and economy of the state; and will always be taken care of. In his words, Mr. Ambode said, “we want to take care of your businesses, and we intend to continue the good work that the Governor Fashola-led government had done as touching your wealth and welfare. Now, we promise not only to continue, but to even take it higher. 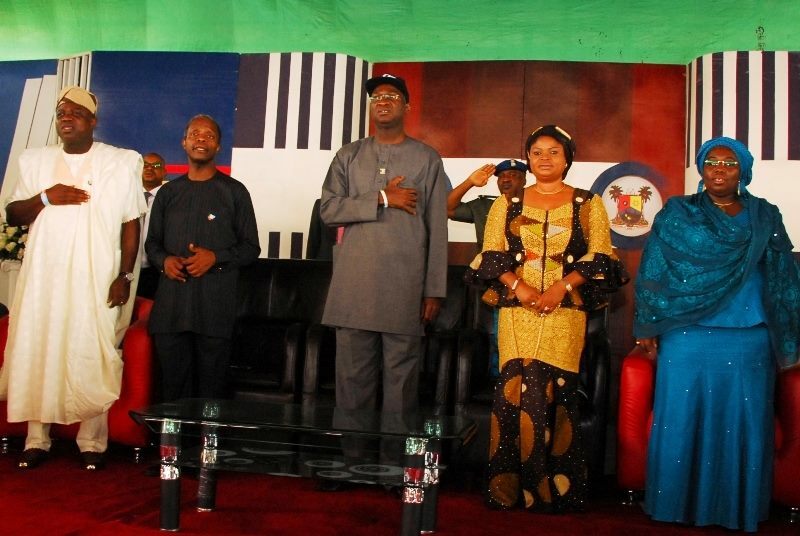 We will create a high level of economic viability in the state, and your businesses will thrive”. Akinwunmi Ambode also urged the audience to also vote for the APC at the Federal level as they vote-in the Party here in Lagos. This he told them will ensure all-round excellence in governance, and hence, increased wealth and welfare for them, their businesses, and families. He pointed out that the glaring achievements of the Party in the states where it is incumbent should convince all well-meaning Nigerians, and Lagosians alike, that APC is the party to be trusted with the responsibility of governance at all fronts in the nation. Also speaking at the event, Professor Osinbajo praised the efforts of the artisans, and urged them to vote wisely in the forthcoming elections to ensure the flow of good governance especially at the Federal level. He said the present government had failed at governing the nation, and that “only a lover of hunger and poverty” will still want to vote in this present crop of leaders at the centre. Earlier at the event, the Special Adviser to the Lagos State Governor on Commerce and Industry, Mr. Oluseye Oladejo, had eulogized the present state government for its productive efforts at always engaging the artisans, tradesmen and the Farmers, through its many programmes designed for their growth and wellbeing. He also expressed optimism at the continuation of such feat by describing the candidature of Mr. Akinwunmi Ambode as one that “holds so much promise”. Present at the town hall meeting was the President of the association, High Chief Bola Sanusi, and a hoard of its members, and they were joined by a host of Commissioners, Special Advisers and other top functionaries in the Lagos state government. In a show of solidarity, the youths in Lagos under the aegis “Ambode Youth Initiative” (AYI), gathered today for a 10,000-Man walk in support of the candidacy of Akinwunmi Ambode, the governorship candidate of the All Progressive Congress (APC) in Lagos. The solidarity walk was convened by the AYI in conjunction with the volunteer arm of Mr. Ambode’s Campaign organization, Team A+, and was also intended to further sensitize the Lagos populace on the excellent personality of the governorship candidate. 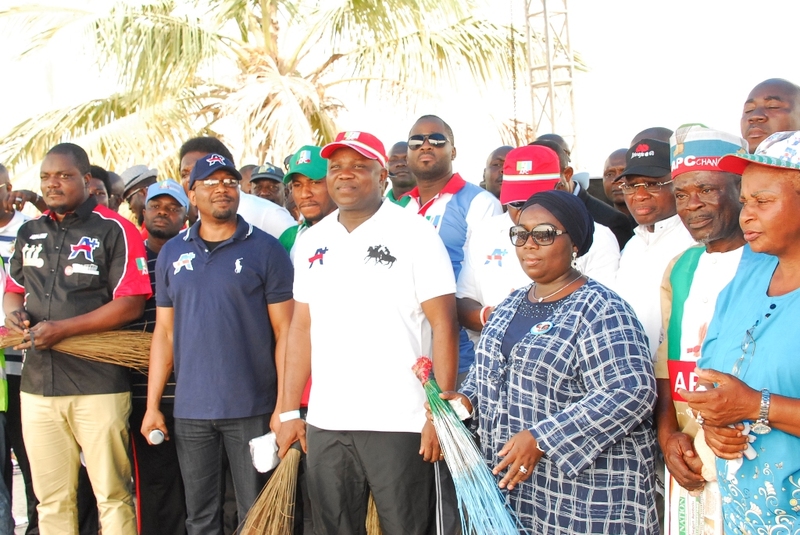 Truly numbering in their thousands, the youths were joined in the walk by the candidate himself, Mr. Akinwunmi Ambode, his running mate, Dr. (Mrs) Oluranti Adebule, APC party stalwarts, Nollywood celebrities, Foremost entertainers, and other well-meaning Lagosians. 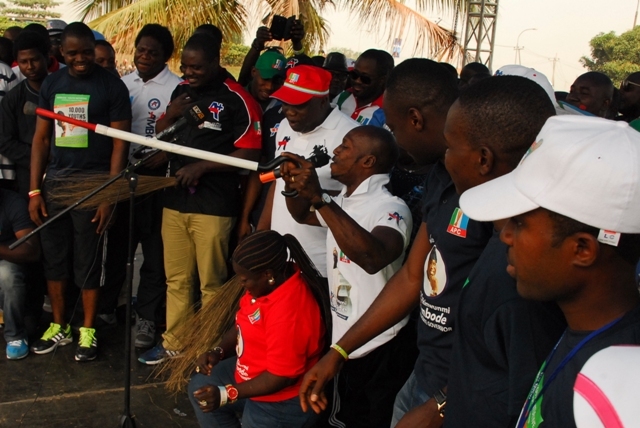 A visibly happy Ambode thanked the youths for the overwhelming turnout and appreciated the strength of all that had come out to participate in the walk. After he had danced to the cheerful tunes made by the mammoth crowd, Akinwunmi Ambode gave a speech that reassured them of excellent governance if elected as the next governor of the state. He said, “We are starting our campaign with the youths, and we do this in order to be true to our intention of creating a new platform that will take our youths to the next level. We are giving governance back to the youths, and I promise you a governance that will also bridge between the elderly and the youths”. 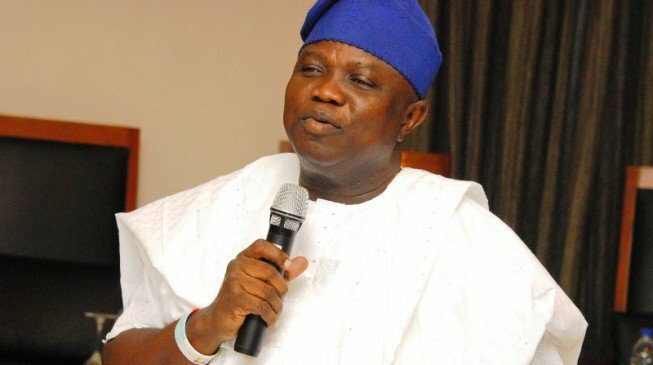 Speaking further, Mr. Ambode said, “We have two major concerns for Lagos, that is, the security and a stable economy for Lagos. This is in-view of creating more jobs for our youths in a secure environment”. The State’s APC party Chairman, Chief Henry Ajomale, also used the moment to canvass support for the man he described as the “best man for the job”. 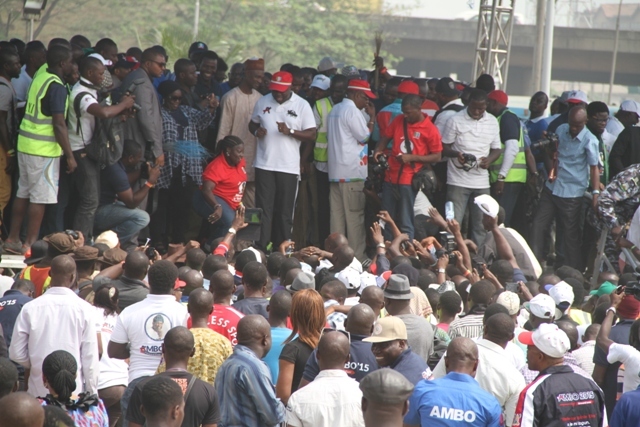 Desmond Elliot, a Nollywood actor and also a Lagos State House of Assembly candidate, spoke on behalf of the celebrities and entertainers present at the walk, assuring of total support for Ambode’s candidature both during the campaign and in the election. Mr. Taiwo Aiyedun, a leader in the AYI, urged all the youths and also all well-meaning Lagosians to support and elect Mr. Akinwunmi Ambode as the next governor of the state to ensure continuity of excellence and better engagement of the youths, after which he gave a vote of thanks. 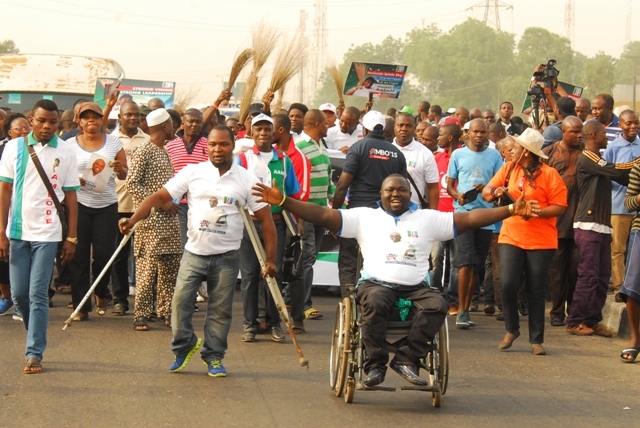 The walk kicked off at the Maryland Comprehensive College, Maryland around 9:00a.m, and was rounded off at the Gani Fawehinmi Park, in Ojota. 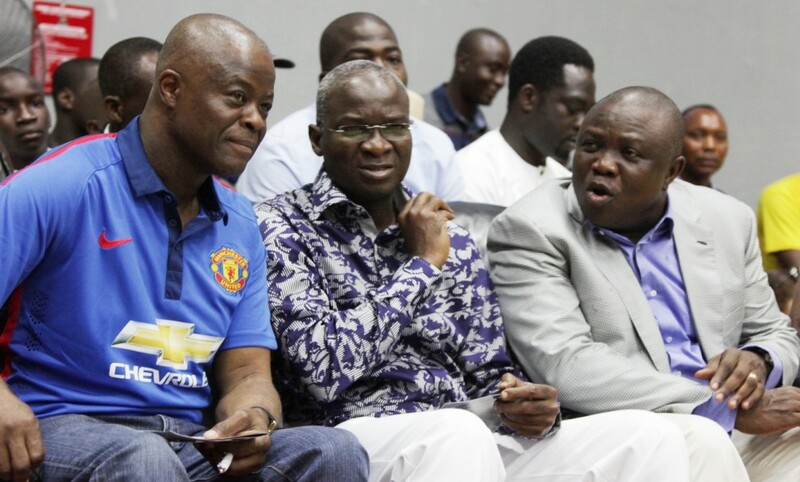 The sport-loving Governor of Lagos state, Governor Babatunde Fashola, and the sport-loving governorship candidate of the All Progressive Congress (APC) in the state, Mr. Akinwunmi Ambode was at the 6th edition of the annual Governor’s Belt boxing competition held today, Friday the 26th of December, 2014, at the Sir Molade Okoya-Thomas Hall of the Teslim Balogun stadium, Surulere, Lagos. 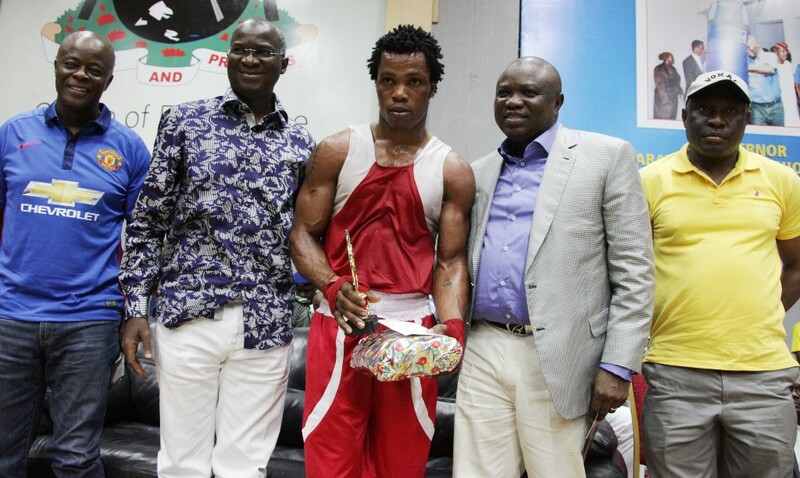 The event was organized by the Lagos Boxing Hall of Fame under the patronage of the Lagos state government. 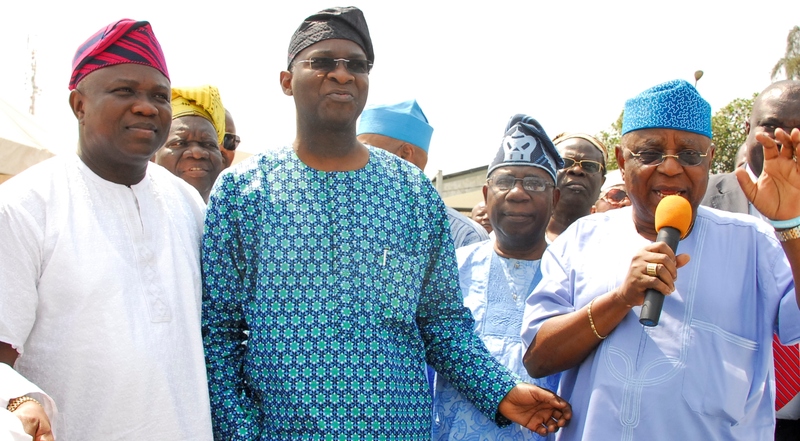 Lagos State Governor, Mr. Babatunde Fashola, SAN (2nd left), Lagos State All Progressives Congress Governorship Candidate, Mr. Akinwunmi Ambode (2nd right), Chairman, Lagos Boxing Hall of Fame, Mr. Wale Edun (left), Permanent Secretary, Youth Sports and Social Development, Mr. Oluseyi Whenu (right) and the Winner of the Male 81kg Boxing category from Lagos State, Mr. Samuel Ebohen (middle) during the 6th Annual Governor’s Belt Edition and 59th Monthly Boxing Show organized by the Lagos Boxing Hall of Fame in conjunction with the Lagos State Amateur Boxing Association under the patronage of Lagos State Government at the Sir Molade Okoya-Thomas Indoor Sports Hall, Teslim Balogun Stadium, Surulere, Lagos on Friday, December 26, 2014.